An intensive roof garden includes planting of small to medium shrubs, grassed areas and occasional trees. Modular planting system requiring very little framework. Rapid installation makes it easy for creative planting design in either verticle or horizontal position. 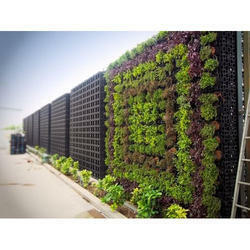 We design and install living walls also known as green walls or vertical gardens. Our unique system makes it possible to transform any vertical surface into a lush and strikingly beautiful garden, either inside or out. Feel the fresh air minus the toxins. Let's Green the Greys..! Also, don't forget to check out our beautiful ZOI Living Bouquets. f you are living in a flat and do not have your own rooftop, you can still enjoy FRESH ORGANIC HERBS from your balcony by growing them on an EDIBLE GREEN WALL. We are offering Green Wall Module to our client. 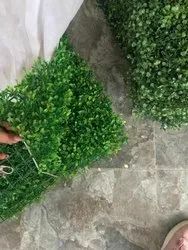 We are offering Interior Artificial Green Wall. Usage/Application: Terrace Wall, Building Facades, Compound Walls, Balcony Walls, Highlight Walls, Unused Walls.